Would you like your students to design the play script of a radio programme, showcase their talents and perform a creative English Radio Drama LIVE in front of an audience? 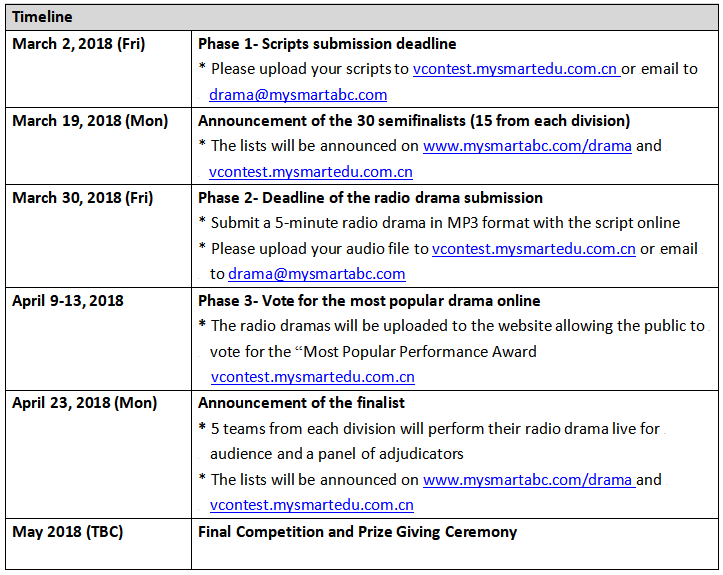 We are extremely proud to write to you and invite your school to participate in our 10th English Radio Drama Competition for Schools in Hong Kong and Macao. We have persevered and this year, we are celebrating our 10th anniversary! Last year, 280 teams from over 90 schools in Hong Kong and Macao participated in our Radio Drama competition. We were overwhelmed by the positive responses from the participating schools. Through this competition, your students will experience the magic of sound and the creativity of their voices. Students can learn and enjoy the fun of script-writing and acting; they can also develop team spirit, improve English Language skills and build their confidence in expressing themselves. It will certainly be a marvelous learning experience for them. The participants will be divided into two levels, primary and secondary. The shortlisted teams from each level will be invited to showcase their talents and perform their English Radio Drama LIVE. NO participation fee is needed in this competition, thanks to the generous support from our sponsors, including Educational Testing Service (ETS), BBC China, DYMO/Mimio, KEA Learning International Ltd, NICI and Striking. The final competition and prize-giving ceremony will be held in May 2018. 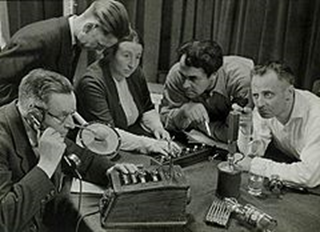 If you are interested in joining our Radio Drama competition, please complete the enclosed application form, then either fax or email it to us at your earliest convenience. For more details about this competition, please visit our website www.mysmartedu.com/drama or vcontest.mysmartedu.com.cn. Should you have any other questions, please feel free to call us at +852 2851 3822 (HK) / +853 6261 6000 (MO) or email us at drama@mysmartabc.com. Look forward to hearing from you real soon. Many of us may not have thought about it. The reality is, it would eventually happen to us and members of our family. Tell us what it will be like to live in an elderly home for a day. ELIGIBILITY TO ENTER: Students attending full-time schools in Hong Kong and Macao are eligible to enter the competition. Students can form a team of no more than 5 members and submit a 5-minute play-script of a radio drama program. Any entry with content deemed to be inappropriate or sexually explicit, containing extreme violence and offensive remarks will be disqualified. Play-scripts must be of original content, and materials taken from pre-existing scripts by writers who are not part of the group are prohibited. Entrants who fail to comply will be disqualified. Any replacements of entrant in groups, extra certificates will not be given.